Beautifully presented in a deeply swept, gilded and embossed frame, this little oil painting is a charming example of a follower of the Dutch tradition for fine detail and richly depicted landscapes. 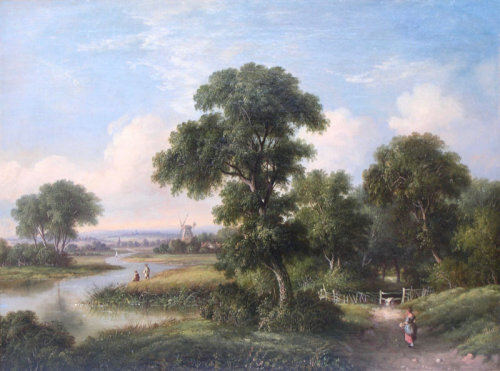 The windmill suggests Holland, but this painting is believed more likely to be somewhere in England, as the distant hills would be unlikely to be found in the Netherlands. This is a little gem of a painting, which sadly, is unsigned. This is surprising as whoever painted this, must have known it was an excellent piece of work and so should have been proud to sign as his or her own.